Looking back to 1993, the UK looked like a different place: Charles and Diana were heading for divorce, the IRA bombed Warrington, UKIP was formed as the Tories waged war over the Maastricht Treaty, Mr Blobby topped the pop charts and the Premier League made its debut. It was also a momentous year for Stoke-on-Trent school boys Mike McDonald and Dan Stubbs. Just entering their teens, the Penkhull boys were undertaking a rite of passage – they were allowed to stand at the Victoria Ground without their dads for the first time. Like many others from the Potteries, Dan and Mike, who are now successful business owners and film makers, will never forget 1993 as they witnessed their beloved Stoke City winning Football League Division 2, racking up 93 points and an impressive plus-39 goal difference. Fast forward 24 years and their business, Inspired Film and Video, are preparing a film to celebrate that momentous 1992/93 season. Macari’s Red and White Army is set for release next year to coincide with the 25th anniversary of Stoke City’s Division 2 Championship crown. The film will be part football and part social history, reflecting on life in the Potteries and even the contribution of Port Vale. It may be hard for some younger Stoke City fans to comprehend, but Vale were among Stoke City’s biggest rivals back then, finishing third in Division 2 before losing in the play off final to West Brom. And who can forget that Dave Regis shot getting stuck in the mud on the Vale Park goal line as Stoke slumped to FA Cup defeat in Burslem? “It was an amazing year for local football but it looks like a different world when viewed from my 2017 seat at the bet 365 Stadium,” reflected Mike. “Stoke had endured terrible times under Mick Mills and Alan Ball and competing for a title, even in the third tier of English football, seemed a huge triumph. Macari’s Red and White Army will include interviews with many players from 1992/93 and Lou Macari, but also supporters, local characters and the former Victoria Ground tea lady. There’s even plans to talk to members of the 1992/93 Port Vale team. Production is now underway and a Crowdfunder campaign has been launched to fund extra features such as purchase of archive film and photographs, music rights and money to pay for film screenings in North Staffordshire. People are being asked to pledge their support in exchange for rewards. 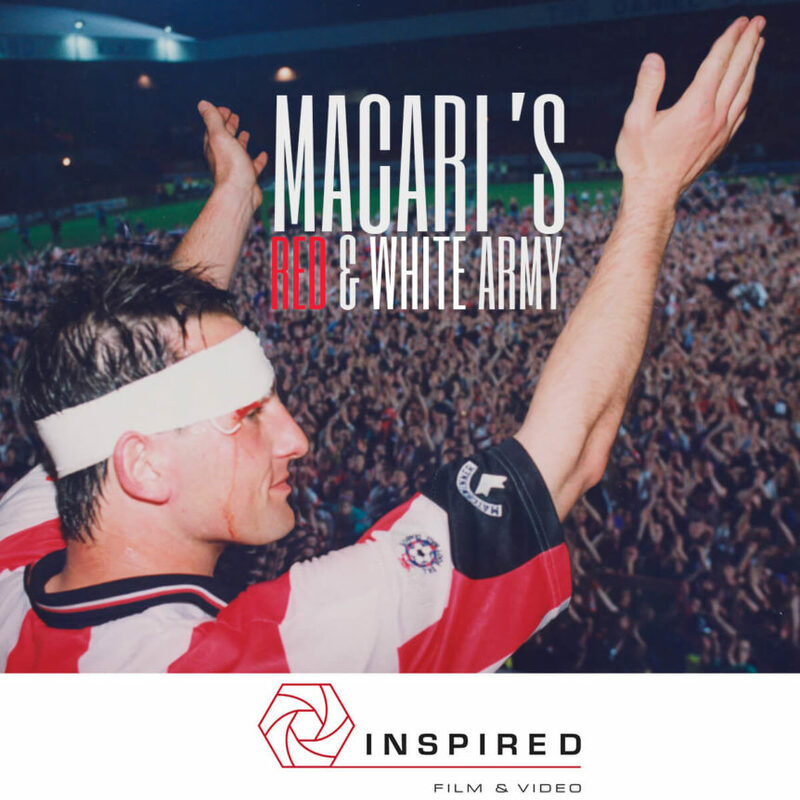 For example, anyone pledging £20 will get a DVD and digital copy of Macari’s Red and White Army; £40 will guarantee a pair of tickets to the film premiere to be held in Stoke-on-Trent and £1,000 gives the contributor the chance to take part in the film making process as a credited executive producer, together with a trip to the 2018 Berlin Football Film Festival. The Crowdfunder page can be found at www.crowdfunder.co.uk/macaris-red-white-army. Mike and Dan are now directors at Stoke-based Inspired Film and Video who work with businesses, sports organisations and charities across the UK. “In a way, 1993 represents our first big sporting memories and we’ve been hooked ever since,” said Mike. “We have been fortunate as our film making careers have led us to meet many huge footballing figures. We’ve made films with Sir Bobby Charlton, completed a documentary on Leicester City’s amazing Premier League winning season and worked with many other clubs, including Stoke City. “But we’ll never forget that season as young Stoke fans. There were great memories and we looked up to players like hard as nails centre backs, Cranson and Overson, Gleghorn in midfield and the Golden One, Mark Stein, up front. “Looking back, the crowds were amazing, we averaged around 16,500 and there were more than 24,000 in the Victoria Ground for the Stoke-Vale derby. To find out more about Inspired Film and Video please go online to www.inspiredfilmandvideo.co.uk.